Can it get more perfect than this?? Who wouldn't want to enjoy the heavenly fragrance of lilacs for the entire summer?! And though we probably love those giant old fashioned lilacs, they can be quite large and overpowering on many of our smaller residential properties. 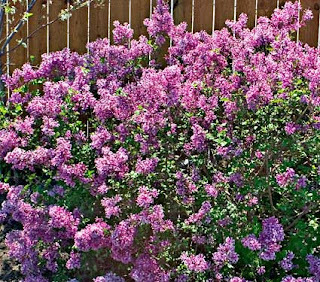 So check out this beautiful new for 2010 Syringa Bloomerang™ lilac at White Flower Farms or Great Garden Plants that stays compact at 4' and makes a great hedge.